The cause of the problem is pretty clear. Heat rises. That means the top of your kegerator is going to be warmer than the bottom of your kegerator. That warmer beer foams when it comes out. The faucet and shank are also warmer. That warmth adds to the problem. How much is the temperature variance? Of course, this will vary from setup to setup and climate to climate. I was relatively shocked by the temperature difference in my own kegerator. The top reading about mid keg and the bottom reading is the top the top of my beer lines. These are about 22″ apart. This graph shows a point in time variance between the two of 14.9 degrees F. My beer is about the temperature I want it, but the top of my serving line is much warmer. That difference in temperature causes the first pint to have too much foam. Pours that happen soon after the first are fine. The tubing, shank and beer are relatively cool. The setup. 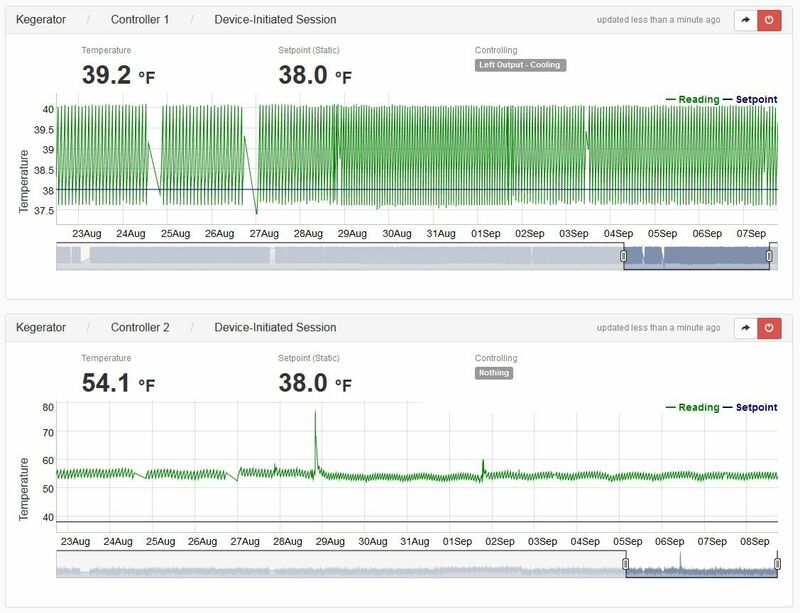 I have two temperature probes in my kegerator. One is zip-tied to the top of a beverage line. The other is zip-tied to a can of beer. 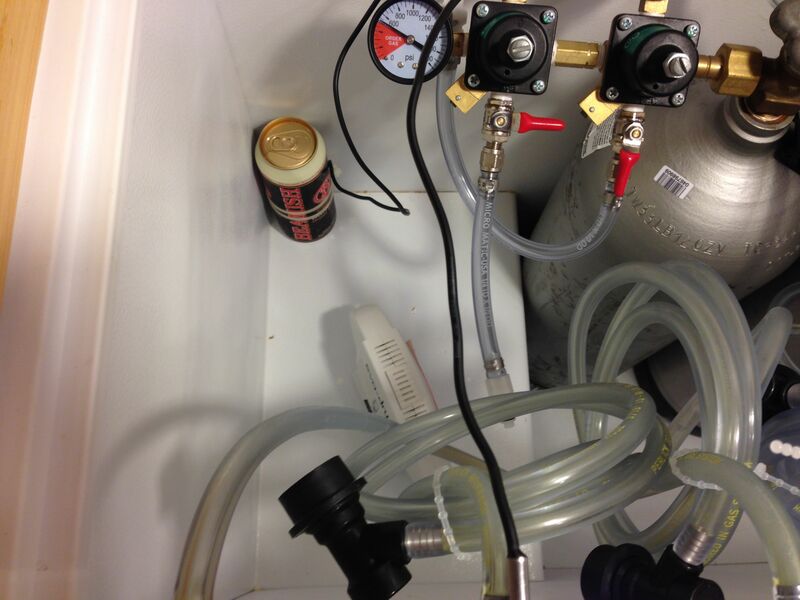 That’s how I have kept the probe in my kegerator for a long time with the thinking that the mass of the can of beer will help to stabilize temperature readings and give overall stable and accurate readings. That can is sitting on the compressor hump of my Kenmore Deep Freeze (8.8 Cu ft Model 16932, out of production). That puts it about mid keg. I placed the fan on my CO2 tank, leaning up against a keg. Yes, you will notice that there’s no beer in the keg. That keg was formerly filled with 1 Hr IPA and I’m sad it’s gone. More Beer’s M-80 IPA is in the fermenter now. I used AC Infinity’s Pre-Wired LS8038A-X 115 Volt AC Fan, because it is reasonably priced, gets great reviews and it’s already setup to use AC. I will say… My guess is that the manufacturer would not recommend this application. If you decide to do something similar, proceed as you see fit. I’m only telling you what I am doing myself. This graph illustrates the effects of adding the recirculation fan inside of my kegerator. Prior to the fan, the tubing temperature spiked to around 55.4 deg F. After the deep freeze kicked on, the tubing dropped to around 53.15 deg F. Not a big change. That averages out to 54.275 deg F.
You can see the point in this graph where the fan is turned on. The temperature drops sharply. The new is high 47.3 deg F and the new low is 42.13 deg F for an average of 44.715 deg F.
The recirculation fan dropped my tubing temperature by 9.62 deg F (62%). Practically speaking, that difference is enough to make every pint pour right. My first pint pours correctly… I like that! A look down. You can see my Eva Dry E-500 (Hands on Review) standing by taking care of condensation. I’ve heard from others that a recirculation fan makes the Eva Dry work even better. My kegerator has remained dry (with the help of the Eva Dry) since installing the fan. A look down my collar. As you can see, I’m no wood worker. Having said that, I spent a lot of time working on the fit and finish of this collar. The end result was good. If you let the deep freeze door fall shut the resulting noise, sounds like a factory seal sort of thump. I did put weather stripping on the bottom to seal between the collar and the deep freeze. Adding insulation to the collar would, presumably, also help maintain temperatures and reduce foaming. Update: As of Otober of 2016 my same fan continues to work great. It has been running continuously in my kegerator for over a year straight. 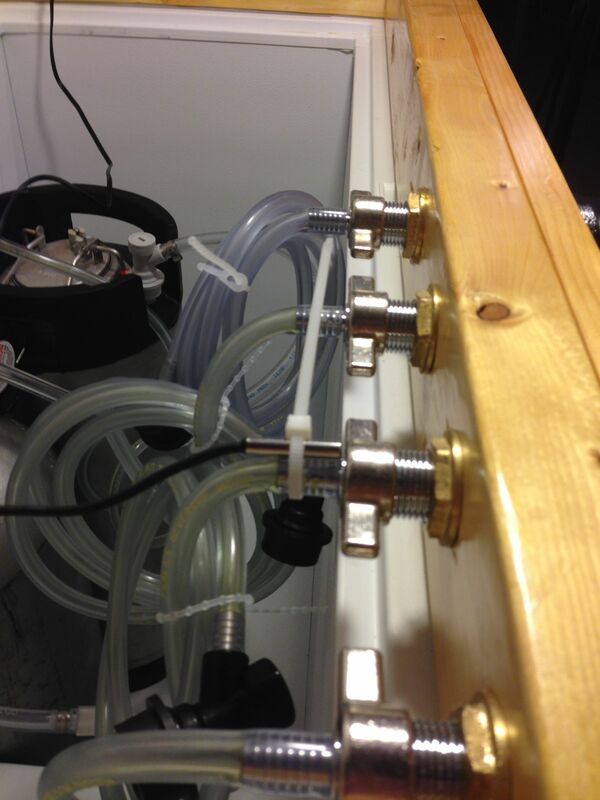 Note – I use an Eva-dry E-500 in my kegerator to held handle kegerator condensation. 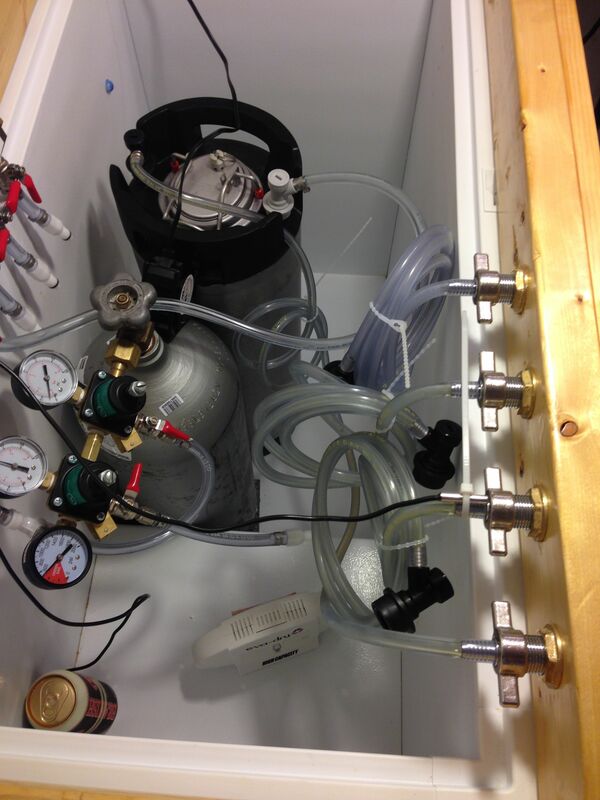 See: Handling Kegerator Condensation with the Eva Dry E-500. I theorize that keeping condensation under control may play a big part in fan longevity. 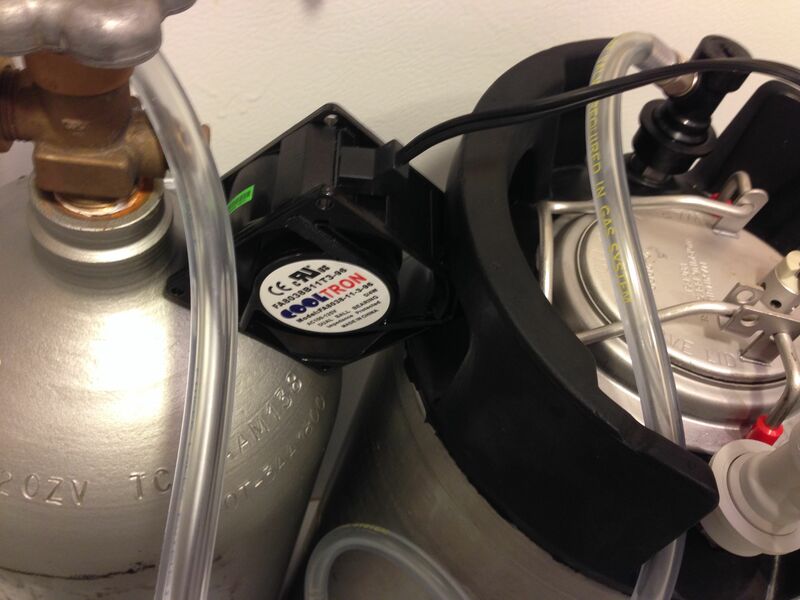 Related: Tips & Gear for your Kegerator | Balancing Your Draft System | Temp Probe Placement | Handling Kegerator Condensation with the Eva Dry E-500 | What’s the Difference Between Ball Lock Kegs and Pin Lock Kegs? This entry was posted in Amazon, Draft, Draft Top Picks, HBF Tested, Homebrew Hacks, My Kegerator, Reader Feedback, Reviews & Top Posts, Top Posts on September 30, 2014 by admin. I have 2x 2.5G kegs in a side by side fridge with Perlick flow control taps mounted directly on the kegs. I love it. You say that you have two temperature probes in your kegerator. One is zip-tied to the top of a beverage line. The other is zip-tied to a can of beer. Which one do you have connected to your temperature controller? I”m assuming it’s the one that’s zip-tied to the can of beer. If so, what do you connect the prove on the top of beverage line to and what do you use this probe for? The temp controller I have has two probes. It can control based on those probes or just track temperatures. The probe that’s on the beverage line is just tracking. Unfortunately that controller is no longer in production. Colder air is denser than warmer air, so the cold air settles on the bottom of the keezer. Adjust the direction of your fan to “blow” upward, to lift the colder air to the top of the keezer. In my keezer, with the fan blowing down, I had about a 5° F difference, upward it is about 2° F.
Does the fan run all the time, or do you have it setup to the temp controller to only run when the cooling unit kicks on? It runs all the time. I don’t think it would be nearly as effective to turn it on only when the freezer is running. I’ve always attributed the foam at the beginning to the faucet being warm. Your findings seem to suggest that isn’t a significant factor. Do you know how much that fan costs you to run? It’s a 7 watt fan, so for me, it would cost $0.59/month, or $7.06/year. A couple years ago I picked up a cheap clip-on fan to help quickly cool down one of my kegs. Since then, I’ve just left it on because it keeps my faucet shanks cold, and therefore more foam resistant. The clip-on works well because I can just clip it to the handle on my keg, and direct airflow against whatever I am trying to quickly chill. What site/software are you using to display your data points? He’s using a Brewbit Model-T. I picked one up after learning about them here and it’s pretty slick – two temp probes, two controlled outlets, I think 25A@120V max capacity. The web interface is confusing and the ports are unlabeled, but it’s not too hard to figure out (though, the web interface could use a lot of work to clarify things, it is usable and nice). I had a guy come from a service company this week to recharge my commercial TDD-4. He works on the refrigeration units for all of the local bars here in Denver, CO. He told me that if I wanted to measure temp inside my refrigerator, to do it with vegetable oil. I don’t know how cold you take your kegerator down, but vegetable oil will not freeze. Plus it’s also got to have a lot of thermal density to it. I’ll be switching out my can of water for vegetable oil soon. Interesting on the VO, the other nice thing is that it won’t evaporate (if you use a glass of water otherwise). that’s actually a great point as well – I had water in my old kegerator and I was ALWAYS paranoid about the water evaporating away. Just never thought of oil before that service guy mentioned it but it makes so much sense. Great article! I’m setting up a chest freezer currently to use for temperature control for fermentation. I love the idea of this little fan. One question, how to you get the cord of the fan outside of the freezer? I’m guessing you made a hole in the side and then closed it up. Or do you just put the cord out the top and all the freezer lid to close on top of it? Do you lose temp or gain excess condensation from this method? I’m getting a freezer but don’t know if I want to put a hole in the side of it. Looking for a suggestion of what has worked for you. Thanks! Thanks for the reply! Picking up one of these fans today. I already have the Johnson A419 and looking forward to running both under the lid. Be glad to be able to hold some constant fermentation temps! Any recommendation on what to do with the probe? Do you submerge it in some water (I’ve read a gallon) or do you affix it to the side of your fermentor? I zip tied mine to a can of beer. You can see that in one of these pictures. I know people submerge them in water and there is talk about submerging them in oil in these comments, I just don’t want to have to deal with having a container of liquid in my kegerator. It would be a good experiment, but I don’t feel like there is a lot of difference vs zip tied to a can. 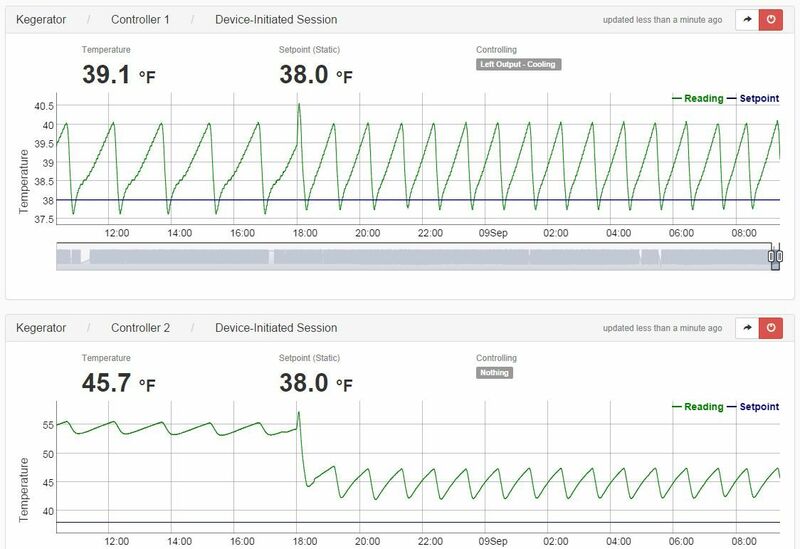 The can provides a good bit of mass and as you can tell by the temperature cycles in these graphs, it is a stable setup. Since fermentation is exothermic, you want the probe taped to the side of the fermenter and then covered with some sort of insulating material to insulate it against the exterior temps of your freezer. I think that Chris is mainly using this keezer for serving, so there shouldn’t be much heat generated by the yeast. But what you say is absolutely true for a fermentation chamber. I’ve also read that there is very little difference between the temp measured the way that you suggest to measure it and from a thermowell inserted directly into the beer, or at least not enough to justify the risk/cost. Adam is right… this is my kegerator and I don’t use it for fermenation. By the way… I’m currently doing a little experiment testing how my zip tied the probe to a can of beer (that you didn’t like) stacks up against a submerged probe. Sneak peak… “Hey, I guess they’re right. Full Cans of Beer, although slow and dangerous behind the wheel, can still serve a purpose.” Name the movie.